The more unique content you write for your real estate blog, the better. The main benefits of blogging are increased content for SEO and more material for new site visitors to engage with. So naturally, the more you write, the better. But writing takes time and energy. We get that. 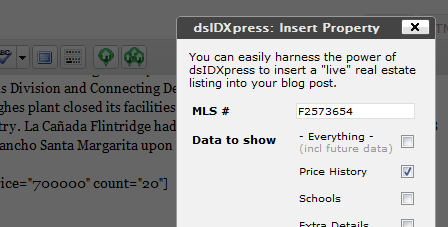 Still, dsIDXpress has a pretty neat feature that makes it easier to write a blog post and insert listing data without you having to do much of any formatting, writing or editing. Here are four types of blog posts you could be writing on a weekly/monthly basis, using dsIDXpress listing data to get your site to rank faster. 1. Write a monthly market report with IDX data. How’s the local market doing? What’s the average DOM (Days On Market)? Are there any new developments in the community? Any new construction homes or other developments that would affect market prices? Irvine Real Estate Market Report: March –, 2012. 2. Use IDX data to write a neighborhood market report. Just as you can write a market report about your specific area for the month, you can write a market report for a “featured neighborhood” of the week. This way, each month, you hi-light a new market area. What’s the average Days On Market? 3. Write about a featured home or an upcoming Open House. Need to hi-light a specific property? No problem. Using the built-in shortcode features you can easily add a single property listing to any post or page. As long as you know the MLS number, you can add a single property listing to your post and decide which data you want to hi-light (price history, schools, extra details, features and the location on a map). 4. Write a daily mortgage report but include new IDX listings so readers can compare mortgage rates and purchase prices. Post Content – Here’s what’s happening on the economic calendar that could impact mortgage rates. Your opinion on whether to lock or float your mortgage rate. Here’s what the interest rate is on a 30-day fixed rate mortgage _______________. Here’s what the interest rate is on a 5-1 ARM ______________. (Insert your necessary disclosures before the end of your post. For example, rates are subject to change upon borrower qualification). Lastly, insert new listings for your particular market area. For example, here are the latest listings and here’s what you can buy for less than $400,000 and here’s what your monthly payment looks like based on the mortgage quote above. Now this post might take a bit longer to write than the others, but still, it’s a great addition of content to keep things fresh (and relevant). How else are you using IDX listings to keep your content fresh? Do you have any creative examples of how you use dsIDXpress? How often do you publish new content to your real estate blog? Any plans on making the dsIDXpress buttons work on the HTML side of things? I would love to see that as a feature – it would make my life so much easier as I do all my writing on the HTML side (the visual editor messes with things too much).